A maths teacher who allowed pupils to settle disputes during out-of-hours wrestling sessions has been banned from teaching. 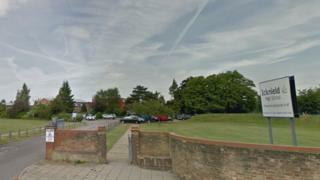 A professional conduct panel found Azam Zia, who worked at Icknield High School, Luton, had failed to tell parents about the off-site sessions. The 37-year-old had also charged pupils between £15 and £20 to attend. He admitted unacceptable professional conduct and bringing teaching into disrepute. The conduct panel, which met last month, heard Mr Zia held the tuition sessions on Saturdays at the Tokko Youth Centre in Luton between August and November 2015. The sessions, which were only attended by Muslim boys, were used to settle conflicts between pupils. They had been organised via email and messaging service WhatsApp. Neither Mr Zia nor a second adult, named only as Individual A, were trained to instruct wrestling, the National College of Teaching and Leadership (NCTL) panel heard. A video shown in private during the hearing to avoid identification of pupils included Individual A wrestling with a student. Mr Zia, who also transported pupils home in his car, admitted all the allegations but said he had intended to open up the sessions to the wider school. He told the hearing he had approached a small group of pupils at first, including female and non-Muslim pupils. The sessions came to light in November 2015 when a pupil expressed concerns to the school's safeguarding officer. Mr Zia was suspended on 20 November 2015 and resigned on 31 March 2016 before any disciplinary proceedings took place. The NCTL panel found he had "failed to maintain appropriate professional boundaries" and that his actions could have impacted on pupil safety. The teaching ban imposed on Mr Zia will last for a minimum of two years.